Parry’s penstemon, one of our region’s most familiar wildflowers, was among the plants collected and categorized during the U.S.–Mexican Boundary Survey (1850–1855). The particular specimen described in the report was collected by Charles Christopher Parry on the Gila River in March of 1852. Parry was a physician whose passion for botany led him to abandon his medical practice and join the Boundary Survey expedition as surgeon and botanist. His specimen appears in the survey report as Penstemon puniceus var. parryi but was renamed Penstemon parryi in 1878. The first published illustration of Parry’s penstemon appeared in 1915 in Margaret Armstrong’s Field Book of Western Wild Flowers . Armstrong was America’s foremost designer of ornate cloth book covers, but in mid-life she took a serious interest in botany. While traveling in the American West, she was dismayed to find no published guides to the flowers of the region and decided to prepare one herself. With assistance from the botanist John James Thornber of the University of Arizona, Armstrong both wrote the field guide and prepared the illustrations—48 color plates and 500 pen and ink drawings. Her Penstemon parryi is gracefully rendered and provides a vivid representation of the flower color. 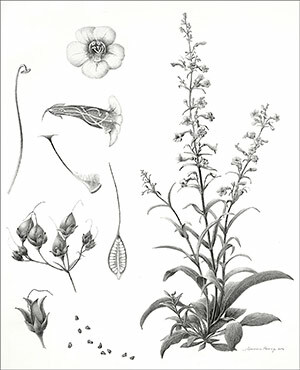 A more complete portrayal of Parry’s penstemon can be seen in this drawing by Adrianna Hewings. While the colors of the plant are not indicated, the artist nonetheless documents the plant with clarity and precision. The habit of a flowering plant is shown alongside several enlarged plant structures. Of particular note are two male structures: an enlarged stamen in the upper left and to the right of that an enlarged staminode, an infertile male structure with a bristly tip. 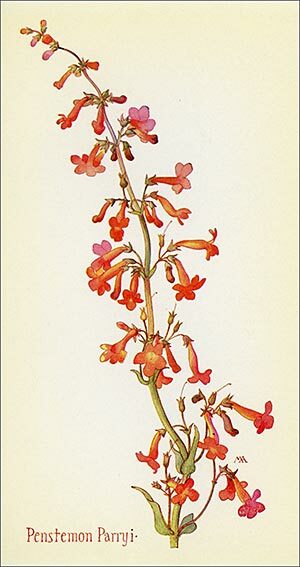 The artist includes a detail of the staminode because it is a key identifying structure used to differentiate penstemon species. Penstemons are also called “beardtongues” as the staminode looks much like a hairy tongue protruding from the flower. This appeared in the March 2014 issue of The Desert Breeze, the monthly newsletter of the Tucson Cactus and Succulent Society.